The isekai on everyone’s minds right now are undoubtedly The Rising of the Shield Hero and That Time I Got Reincarnated as a Slime, which both have anime adaptions that are currently airing. 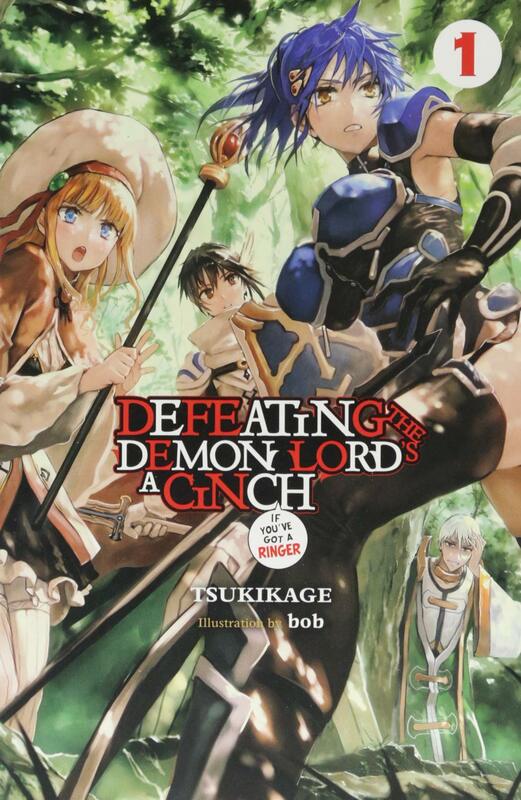 However, instead of looking at blockbuster hits, today I want to talk about the first volume of Defeating the Demon Lord’s a Cinch (If You’ve Got a Ringer) which Yen Press released late last year. With an intriguing twist on your average isekai set-up, the series promises to offer something a little different in this crowded and ever-evolving genre. The story begins ten years after the demon lord Kranos declared war on mankind. With the situation becoming ever bleaker, the Ruxe Kingdom decides that the only solution is to summon a hero from another world. Our protagonist, Ares Crown, is a reverend of the church of Ahz Gried and is sent to fill the role of priest in the hero’s party. Defeating the demon lord is no easy task, and Ares, who’s well versed in battling dangerous beasts, is prepared for the difficult journey ahead. However, what he finds upon meeting the hero’s party is much worse than he could have ever anticipated! The summoned hero is named Naotsugu Toudou, who’s a novice at sword fighting and level 15. He’s joined by the seemingly sheltered mage Limis Al Friedia, who’s also level 15, the third child of the prince of Friedia, and is only able to use fire magic. The final member of their party is swordmaster Aria Rizas, who’s level 20 and the daughter of a renowned swordmaster. She studied under her father for many years and then suddenly swapped sword schools, a move that’s left her very little knowledge of the new school’s sword style. Fans of comedy series KonoSuba will probably find this situation familiar, I’m sure. To Ares this party screams unprepared, and the longer he spends with them, the more unfortunate things he discovers! As Naotsugu is at such a low level where even weaker demons pose a serious threat, Ares desperately needs to get him levelled up before the demon lord crushes the world’s last hope. Things only get worse for Ares when Naotsugu kicks him out of the party, proclaiming that he wanted an all-female group. Now that our priest is forced to work in the shadows to protect the group, and unknowingly guide them in the right direction, will he ever get a break? What I liked about Defeating the Demon Lord’s a Cinch is that instead of Naotsugu, the isekai’d character, being the focus, we instead see the story through Ares’ eyes. He’s surrounded by problems that only he can solve and his job is incredibly stressful, but he’s also so well versed in adventuring that he’s an instantly likable protagonist. Ares is easy to sympathise with where Naotsugu isn’t, due to his overconfident and dense personality. While the characters in the hero’s party all have issues, Ares believes that he can fix them. Limis should be able to contract other spirits on their journey, which will give her the ability to use more than just fire magic, whereas Aria and Naotsugu just need to grow with experience in general. Humans of this world are able to level up to 100 (and perhaps higher, but only three people have ever achieved such a feat) and if Naotsugu and his party are to stand a chance against the demon lord, they’ll need to hit these heights. The biggest problem Ares faces is that Naotsugu is, well, an idiot, to put it bluntly. Even at level 15 Naotsugu accepts quests to take on monsters that level 50 adventurers would struggle with, and poor Ares always ends up dealing with the mess before Naotsugu meets his death. All of this makes for a compelling read and, even at just under 300 pages, I found myself unable to look away. This is down to how well written the story and cast are. Author Tsukikage has clearly worked hard to make sure the humour clicks with the reader and that Ares, while constantly in a state of exasperation, is likable. In fact, for all their silly quirks, I ended up liking everyone in the hero’s party. That’s a real achievement on the author’s part because there are usually one or two that rub me the wrong way. There’s clearly a lot of room for growth with everyone too, which will really make a difference going forward. Tsukikage is also talented in weaving in just enough intrigue to keep you reading, like not outright revealing Ares’ level but leaving clues about what it could be and dropping hints about why the hero ended up with a novice mage and swordmaster. It’s the little things that bring this book together. The other nice thing about having Ares be so accomplished is that Tsukikage gets to write some outright fantastic fight scenes within the first volume, the likes of which you wouldn’t normally see early on in a story like this. Illustrations for the series have been handled by bob and are in a watercolour style that’s very similar to the illustrations for Grimgar of Fantasy and Ash. The pictures look great in colour, but the black and white counterparts often look slightly muddy. I’d also liked to have seen some of the action scenes illustrated as everything in this volume was of the cast simply interacting with one another. Having said that, I liked the artwork overall and the images depict comedic moments in an entertaining fashion. Defeating the Demon Lord’s a Cinch (If You’ve Got a Ringer) comes to the UK thanks to Yen Press, and so far two of the four volumes released in Japan have been put out in English – with the other two due for release later this year. The series does seem to be on-going in Japan, albeit slowly. Volume 1 has been translated by Alex Kerwin and reads well. They manage to perfectly capture Ares’ personality and the dialogue between the characters flows well. Overall, Defeating the Demon Lord’s a Cinch (If You’ve Got a Ringer) offers a welcome twist on the isekai tropes and fans of KonoSuba and series of its ilk will find a lot to like here. The nice thing is that even if you don’t usually like isekai, this series slots comfortably into being a simple fantasy – so it may be more appealing to a wider audience. There’s a lot of room for growth, and, with a surprising reveal at the end of this volume, I can’t wait to see where the story goes from here!